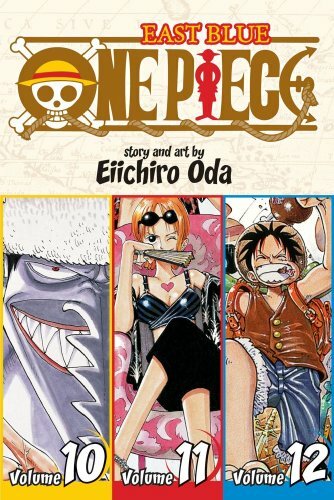 The fourth omnibus edition of Eiichiro Oda’s One Piece (Viz), collecting volumes 10 through 12, gives me the chance to talk about Oda’s sometimes counterintuitive pacing. This is one of my favorite aspects of Oda’s storytelling. In “I have a dream” shônen, character and plot milestones can be as much of an ordeal for me as a reader as they seem to be for the protagonists. When it takes two volumes for a character to climb a set of stairs, I start wondering what Sawako is up to in home economics class. When chapter after chapter is devoted to the hero’s awesome new power-up and just how he achieved it, complete with color commentary from every other character in the comic, I start calculating how long I’ll have to wait for the next volume of Ôoku. I’m increasingly convinced that Oda feels the same way. Luffy, the captain of the Straw Hat Pirates and the star of One Piece, wants to be King of the Pirates. To achieve this, he has to enter the Grand Line, which is where all the big pirates earn their reps. Since this is a big milestone, the part of me that still didn’t fully trust in the ways that Oda is a different kind of shônen storyteller expected it to be a protracted ordeal to read. It takes about a chapter. It’s a fun chapter, but the efficiency with which this milestone is presented convinces me that Oda is much less interested in the obvious epic beats, the stations of the shônen cross, than he is in building unexpected milestones out of side stories and throwaway bits that become huge when you aren’t looking. This approach is entirely consistent with Luffy’s, who runs entirely on instinct or, if you prefer, a tendency to be distracted by something sparkly. There’s a joke in it – that Luffy’s short attention span actually ends up leading him closer to achievement of his goal. The adventures that result from his distractions make him and his crew stronger, and they strengthen the crew’s bond and their trust in his leadership. 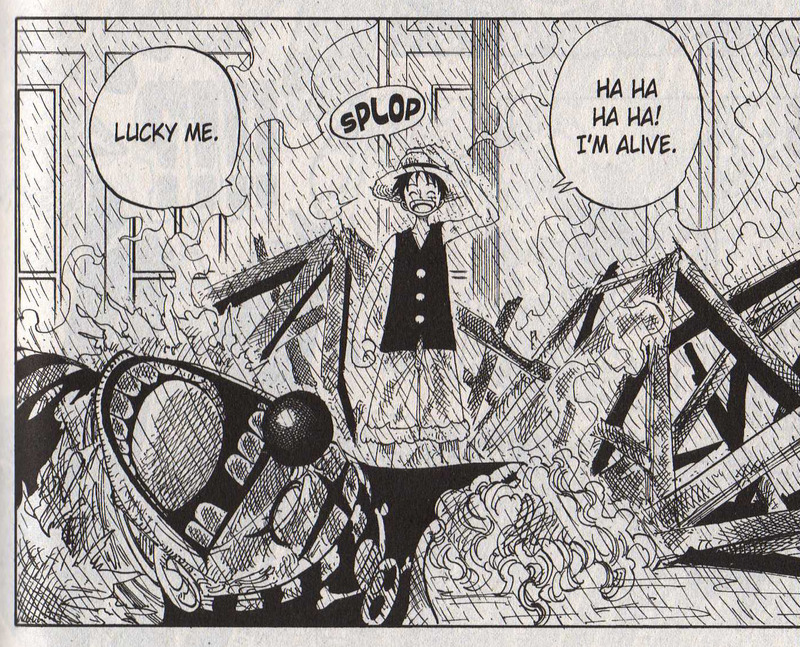 And that trust isn’t founded solely in Luffy’s ridiculous luck. He has force and authority as a leader largely because he trusts in his crew and will fight like mad to protect them and further their interests. Another aspect of series that really rings a bell for me is that it’s an excellent team book. This may be more relevant for someone like me who’s read a lot of Avengers and Defenders and Justice League stories over the year, but Oda strikes just the right character balance. The Straw Hats are a mix of heavy-hitters like Luffy, swordsman Zoro, and lethal kicker Sanji, and smart and sneaky types like sharpshooter Usopp and thief Nami. As the best Avengers writers did back in the day, Oda lets everyone contribute to a successful resolution, and everyone gets a great moment or two that’s driven by their essential natures. Since they’re kind of spoiler-y, I’ll highlight a few after the jump. You are currently browsing the The Manga Curmudgeon blog archives for the day Sunday, May 9th, 2010.